Professor Induruwa pioneered academic and research networking and Internet deployment in Sri Lanka. He served as prime mover, Principal Investigator and Project Leader of the Lanka Experimental Academic & Research Network (LEARN), to provide data communications throughout the island in 1989. Just as impressively, he convinced the Sri Lankan government, which in 1989 was fighting two civil wars, to support that network. With limited resources, Induruwa then introduced LEARNmail in 1990, deployed LEARN -- the first IP Wide Area Network in Sri Lanka -- and established Internet connectivity in 1995. He served as the administrative contact for the .LK domain until 1998. Today, LEARN connects all universities and research centers in the nation. His efforts paved the way for the later establishment of commercial Internet services in Sri Lanka. Induruwa was appointed to the inaugural board of directors of the Computer and Information Technology Council of Sri Lanka in 1983. He continued until 1998, chairing many Working Committees on data communication and computer networking and contributing to national IT policy development and implementation. He founded the Department of Computer Science and Engineering at the University of Moratuwa in 1985 and served as the head of that department until 1998. He graduated from the University of Moratuwa with First Class Honors in Electrical Engineering and won the Prof. O. P. Kulshreshtha award for the Best Electrical and Electronic Engineering graduate in 1975. He earned a PhD from Imperial College London in 1980. 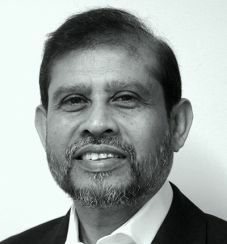 A founding member of the Computer Society of Sri Lanka, Induruwa is also a Chartered Engineer and a Chartered Fellow of the Institution of Engineering and Technology, UK; the Institution of Engineers, Sri Lanka; and the British Computer Society. The Computer Society of Sri Lanka awarded him an Honorary Fellowship in 2003.